I just joined after reading this site for a while. 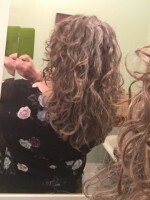 I have naturally wavy hair and have fought with it for many years - straightening, curling, teasing...well, a few years back, I started on a more natural care kick. I guess I'm turning into a hippie in my old age. After being an Aveda girl for a long time and having my "straight cuts" there, I decided to go sulfate and -cone free and stop heat styling my hair. I've used Mop Top products, ayurvedic shampoo with soapnuts (reetha) + amla + shikakai, apple cider vinegar rinses, and most recently I picked up some Chagrin Valley shampoo bars that I'm trying out. I also used to box dye my hair and have switched to applying henna instead. My problem is haircuts. I really need a haircut, and I'd like to chop off a LOT of the old damaged hair and get a good cut. I have used this site in the past to try to find a curl-friendly salon with no luck. The first place I went was a Deva salon. 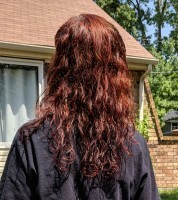 The lady spent all her time trying to sell me products, and trash-talked henna as being damaged - all the while telling me how wonderful her salon's chemicals were. The haircut itself looked ok, until I washed it. Then I realised she cut it unevenly. Wow. That was a lot of money to spend on a mistake like that! The second place I went was another well-reviewed place in Westport. They did a dry cut, but then put so many products on it and they STANK to high heaven! In addition, NEITHER of these places were Curly Girl friendly. I had to clarify out the -cones afterwards. What do my fellow wavies do for haircuts? Is it weird for me to want to find a place that will just cut it dry and not use any of their nasty products in it? Are there any salons in the Kansas City area that y'all can recommend that I might have better luck with? Really getting tired of spending $65+ on meh haircuts. Welcome! No suggestions from me since I don't live there. Just wanted to say hi! I found a couple more salons I think I'll try. One actually has a service menu item of dry cuts, and the other is an Aveda salon that charges full price and dry cuts. Both have pretty good reviews, so we'll see I guess. Hi T. I'm in the same boat, almost. Moving to KC after having a WONDERFUL curly stylist in St. Louis for the last 8 years. I'm freaking out that I can't find anyone in KC and thinking about driving back here to Curls by Cass so no one messes up my lovely curly cut. My hair is fine and a bit thin and we've been working on my cool, shorter 'do for 2 years. Hoping my post will bump this to get us more feedback. --Moving to KC... Kurl Crazy!